It should be, heal 1 or 2, draw a card since power word shield boosts a creature by 2 health and draw a card. Or maybe when it's only played, you draw a card then you heal 2 for every attack that creature makes. I wonder if facehunters/facepaladins will be stupid enough to keep attacking when you put this on their minions :P We'll certainly find out who the bots are :) I'm actually half-expecting them to still go face when you put this on a low attack minion; they often ignore my illuminators in my favourite secrets deck even when they could trade it on board. Use on Lightwarden or Holy Champion and hit face for extra 2 damage for every turn. Could definitely see this as a 1-of against aggro decks. Putting it on an enemy minion heals you for 4 every time it attacks. 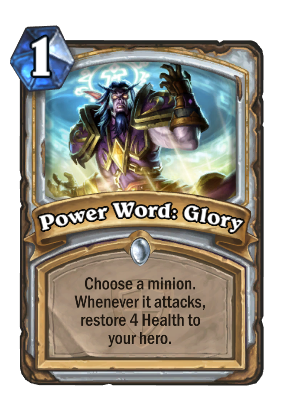 That moment you put Power Word: Glory on the Huffer and just laugh. If the meta is really fast, MAYBE? I don't really see it working out with current priest lists. No, this works for the Paladin Blessing of Wisdom. Even on an enemy minion, the person who cast the spell would gain the heal, and presumably take the damage if they control Auchendi. Does blessing of might work? I don't think so. Case closed imo. EDIT: I meant blessing of wisdom. Doesn't work? Just look at all these eboladins! Sorry, wrong card: I meant blessing of wisdom. I don't think it's good enough. Aggro counter I guess. But they'll just stop attacking with one of their tiny charge minions and move on.